Safran Electronics & Defense’s Cassiopée data management solutions enable aircraft operators to automate the use of their flight data recording. Our solutions allow to decode, cleanse and sort operational flight data and improve readability of Flight Data Monitoring (FDM) / Flight Operations Quality Assurance (FOQA) by combining them with external data. 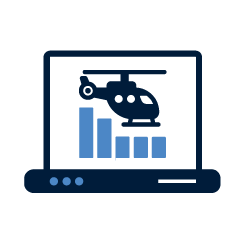 Our software packages can be used on any aircraft, with solutions both on-premise or SaaS (software as a service). All our solutions are regulatory-compliant.